We supply steel, highgrade stainless steel and solid plastic cable carriers and plastic cable carriers with aluminium stays (Hybrid cable carriers), in standard sizes or tailormade to an individual customer’s requirements in millimetre units. Our scope of supply ranges from small units of only a few millimetres as for an inkjet printer to giant chains for oil platforms where the chain weighs several tonnes. With properties suited to all application situations, for example stable and robust, with fixed chain widths or variable widths, for long unsupported lengths and 3D applications. Particularly quiet and lightweight, in a covered design and quickly openable. Or for extreme conditions, for example heat-resistant or suitable for clean room environments. Robust, double stroke system for long unsupported lengths. Single paty end connector with intergratable strain relief comb. 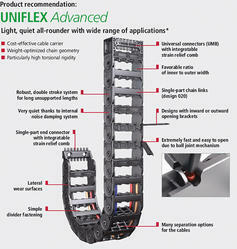 Universal connectors (UMB) with integratable strain relief comb. Favorable ratio of Inner to outer width. Designs with inward or outward opening brackets. Extremely fast and easy to open due to ball joint mechanism. Many separation options for the cables. The operation of the QUANTUM is extremely quiet and low-vibration. Due to the link-free design and the very small pitch, the so-called polygon effect is minimized. Due to the low noise during operation, the QUANTUM cable carrier system is optimally suited for applications with low-vibration linear drives. Extruded sidebands are installed. In contrast to conventional pin-hole joints, there is almost no wear (link wear), and therefore QUANTUM is excellent for use in clean rooms. Transmission of forces (tensile and thrust forces) over a large area – optimized link design – "life extending 2 disc principle"
Steel cable carriers with extremely sturdy link plates and a joint design with multi stroke system and hardened bolt, proven successful for many years. The extremely sturdy design provides extensive unsupported lengths and allows high additional loads. The operation of the TKR is extremely low-noise and low-vibration. The so-called polygon effect is minimized. Optimum uses are especially handling and installation systems, robots, measuring equipment, automatic pick and place systems, printing and textile machines. Due to their low noise during operation, the TKR types are optimally suitable for applications with low-vibration linear drives. 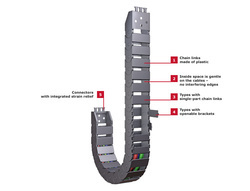 The movable connecting elements are injection molded on the chain links. In contrast to conventional pin-hole joints, there is almost no wear (link wear), and therefore the TKR types are excellent for use in clean rooms.The special shaping of the connecting elements also increases the service life of the system. One supplier and contact person for the complete system. We develop, design and supply all components required for your individual cable & hose carrier system. We help you . . .
. to cut your costs! No hidden costs, e.g. cables being cut to excessive lengths etc. Looking for CABLE CARRIERS ?